What a great idea! These rings are perfect for sliding over old toys to make them new again, put onto your own finger to give your FIDs some diversion when you're doing something they aren't fond of (like getting their nails trimmed). You can place them over a ParroTrap, or onto a doily disk and attach with a ParroLink for an interesting hanging or foot toy ... so many so many ways to use this fun ParroPine ring! Great foot toy, great part, great idea! At this price, you should get several packages and use your imagination for some great avian fun! 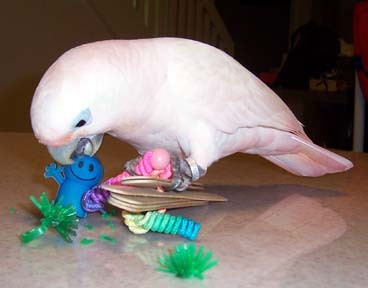 Grommet, Goffins Cockatoo photo on top of page, loves the smiley stix foot toy which includes a ParroRing, which he has enjoyed destroying!